The new DriveCore™ Install series amplifiers is a complete line of high performance installation amplifiers based on the proprietary DriveCore technology. DCi Series amplifiers are designed, engineered and manufactured to the industry’s highest quality standards, and provide system integrators with the advanced features and flexibility required for challenging 21st century installed sound applications. Versatile, compact and highly energy-efficient, DCi Series amplifiers continue the unbroken Crown tradition of leadership in professional and commercial power amplifier technology. Recommended for: Installed Sound, Cinema, Recording Broadcast. TRUE RACK DENSITY – Power points of 300W or 600Win 2-/4-/8-channel configurations – all in a 2 Rack Unit form factor. More channels in one box allow smaller infrastructure rooms that can reduce operational costs while giving you the utmost in installation flexibility. DIRECT DRIVE CONSTANT VOLTAGE – Save money by using smaller gauge wiring to drive the speakers using either 70Vrms or 100Vrms. With no need for a step-up transformer at the output, the DCi produces higher audio quality much more efficiently. 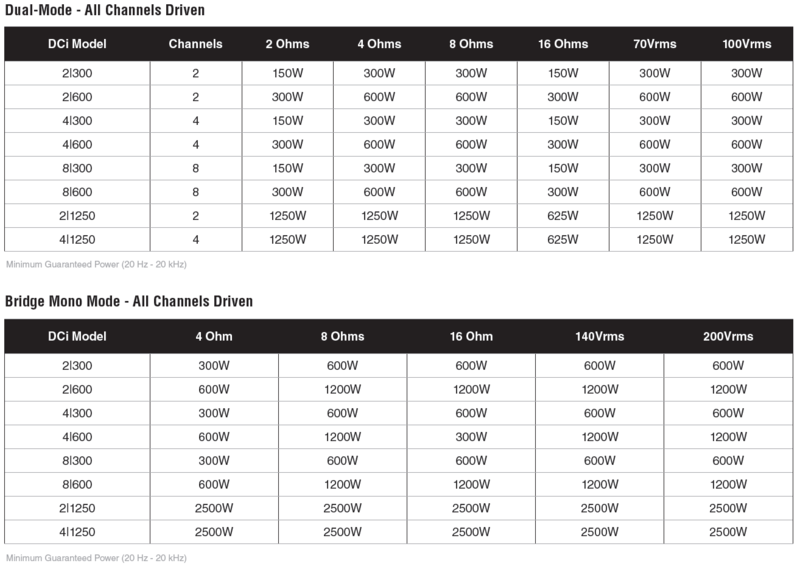 CHANNEL INDEPENDENT HI-Z/LOW-Z SELECTION –Drive either one or two speakers in low-Z mode, or literally hundreds of speakers in high-Z mode (70Vrms or100Vrms). This means better design flexibility since DCi powers all loads on a channel-by-channel basis. BRIDGEABLE CHANNEL PAIRS – Unlike amps from other manufacturers, the DCi Series channels are bridgeable – even in 100Vrms mode – which means even more adaptability for higher power applications such as subwoofers. REMOTE ON/OFF INTERFACE – Save power by integrating the amplifier into a control system so you can easily turn it on and off. EFFICIENT COOLING DESIGN – Highly efficient internal cooling fans provide airflow to the most heat-generating parts. Incorporating the fans into the amplifier brick design maximizes cooling while minimizing wasted energy and noise. ADVANCED POWER FACTOR CORRECTION (PFC) UNIVERSAL POWER SUPPLY – The most advanced power supply in an installation amplifier delivers power more efficiently in almost any condition than anyone else, resulting in less power dissipated and less heat in your racks.